Recorded in 1985, this seminal album from Westminster Cathedral Choir and David Hill is a true jewel in the crown. These are among the the first performances in modern times of the divine compositions of Francisco Guerrero and Alonso Lobo, and there is also a Magnificat by Sebastián de Vivanco, a composer barely known even now. These recordings date from the peak of a golden era in the history of this most illustrious of choirs, and have yet to be bettered. Francisco Guerrero was the most influential and respected composer in Spain in the time of Philip II. Born in Seville in 1528, he died there in 1599. After an appointment as maestro at Jaén (he was only seventeen), he returned to Seville, first as a singer, then for many years as assistant to the long-lived but ailing Pedro Fernández, and finally from 1574 to 1599 as maestro de capilla of this greatest and wealthiest of Spanish cathedrals. If Toledo held the power, it was Seville that surpassed all in riches and in the splendour of its services, its choir and instrumentalists. Guerrero published motets, Masses, Psalms and canticles for Vespers, music for the Office of the Dead, two Passions and a fine collection of vernacular Spanish religious villancicos in prints issued in Seville, Louvain, Paris, Rome and Venice. His publications span the years 1555 to 1597. A fine musician, gifted with a beautiful contralto (high tenor) voice, he played the organ, vihuela, harp and cornett. He was taught briefly by Morales, who had been taught by Peñalosa, an emulator of Josquin. Guerrero certainly met the young Vivanco, who nearly became his assistant, and he knew well Alonso Lobo, who did. Guerrero met Victoria when they were both in Rome in 1581, and Victoria paid tribute to the older man by including two of Guerrero’s motets in his own book of 1585. The links go on: Victoria and Vivanco could only have been a class or two apart as schoolboys in Avila. Alonso Lobo, an Andalusian like Guerrero, was maestro at Toledo when Victoria was established at Madrid. It was Victoria who acted as agent for Lobo in the printing Lobo’s 1602 Book of Masses. This chain of composers represents just a few of the hundreds, as yet barely known to us, that form a tradition not simply in the Siglo de Oro in music of great quality, but one that stretches right through to the end of the seventeenth century. Then, and only then, did Spanish music decline into a province of Italian style. 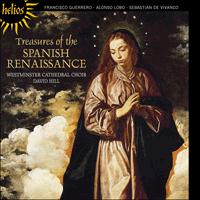 The motets of Guerrero chosen for this recording are quite varied in manner and in their distribution of voices. Surge propera (1570), lively and full of invention, makes the Church interpretation of the Song of Songs very clear indeed. The second treble part is a cantus firmus obstinatus repeated five times, descending one degree of the scale at each appearance in the first half of the work. Then this repeated phrase rises by degrees, again five times, in the second half. ‘Veni sponsa Christi’ is the text of this ostinato; ‘Come, bride of Christ’ leaves no doubt that Guerrero had no thought that the Song of Songs was just Hebrew love poetry. The other five voices teem with energetic counterpoint while this second treble seems to cut through like an exposed structural girder. Morales, Guerrero’s distinguished precursor, was a great exponent of this technique. Quite different, and more modern in flavour altogether, is the thoroughly harmonic, declamatory and clearly antiphonal double choir motet O altitudo divitiarum (1597). This makes use of a high choir (SSAT) and a low one (SATB), a division of singers that became almost standard in Spain for a century. In this work we use organ, harp and bass dulcian, very much in keeping with Sevillian practice at the end of the sixteenth century. Yet another contrast is the plangent O Domine Jesu Christe (1570) for Palm Sunday, a work of simple but heartfelt sadness, anticipating all the sufferings of Christ’s Passion. The undivided four-part choir allows Guerrero full freedom to exploit his gift for expansive melody. O sacrum convivium (1570) is for six-part choir with a low emphasis (SAATBB). This is a richly woven tapestry of sound depicting the sacred banquet of Communion. The whole post-Reformation Catholic devotion to this sacrament seems embodied in this rapt and sustained inspiration. Many of Guerrero’s works were published more than once in his lifetime. Many were copied out in cathedral choirbooks for centuries after the original prints had fallen apart from use. His works were more widely known in Spain and its Empire, in Mexico, Lima and Bogotá, than those of any other composer. Above all, Ave virgo sanctissima was his greatest ‘hit’. Guerrero published it in 1566, in 1570 and again in 1597. Masses derived from it were published by Géry de Ghersem (1598; an amazing seven-voiced work, full of canons), Pedro Ruimonte (1604), Juan Esquivel (1608) and Juan del Vado (circa 1670; Mss. at Madrid and Avila). Ave virgo has a most beautiful text honouring the Blessed Virgin and comparing her to the pearl, the lily and the rose, very much in the manner of the biblical Song of Songs. There are five voices of which the two treble parts form a canon at the unison. Sweet and delicate phrases echo through these parts in some of the most evocative melodies ever written. One stunning episode occurs before the half-way point, when ‘Salve’ is set to successive entries of the four-note plainsong intonation of ‘Salve regina’, but with a raised semitone that transforms the climax into real drama. This most famous of Guerrero’s works subsides, gradually more calm, gently, to a quiet close. Guerrero’s final contribution to this collection is his bright and triumphant Regina caeli laetare (1584); not startlingly antiphonal, it nevertheless is for eight voices distributed as two equal choirs. The ringing ‘Alleluia’ endings of each section show how vigorous Guerrero could be. It gives the lie to the impression that used to be passed on by music histories that would have Guerrero over-sweet, lacking the strength of Morales and Victoria. Alonso Lobo was born in 1555 in Osuna, a town about fifty miles from Seville. After rising to a canonry in the collegiate church at Osuna, he was appointed in 1591 as aide, and no doubt probable successor, to the then elderly Francisco Guerrero in Seville. His reputation by this time must have been considerable, since the Sevillian Chapter offered him his position without the usual formal tests of musicianship. He remained at Seville from September 1591 until the same month in 1593, when he was elected to the post of maestro de capilla at Toledo Cathedral, in succession to Ginés de Boluda. Later, in 1604, Lobo returned to Seville when he became chapel master at the Cathedral, remaining there until his death in April 1617. His most important surviving works are six Masses (one a parody on Palestrina’s Pentecost motet O rex gloriae), and seven devotional motets published in Madrid in 1602 under the composer’s supervision. Apart from their presence in such major centres as the Sistine Chapel in Rome, and Coimbra in Portugal, copies of this publication found their way to the New World, no fewer than five of them still being extant in Mexico today. These and other works of Lobo were in use in Spain, Portugal and Mexico for more than two centuries after his death: his Lamentations were re-copied in a Seville choirbook in 1772: and his Credo Romano was obligatory at Seville on Sundays, on the Feast of Corpus Christi, and some other days, according to the Cathedral Chapter rules of 1648. All the motets in the 1602 publication are now published in modern performing editions by Mapa Mundi. The quality of these seven motets is consistently high and individual. The emphasis is upon expression and beauty of sound in an atmosphere of intense but non dramatic religious devotion. The voices are written occasionally with some angularity but always for some expressive purpose. The Roman smoothness and perfection of line that we find in Palestrina and even in Victoria is not characteristic. The style is provincial in the proper sense; just as the style of Byrd, Weelkes, and Gibbons was peculiarly English, so the motets of Lobo and his contemporaries, Esquivel and Vivanco, are beginning to be recognized as peculiarly Spanish. Versa est in luctum must have been written in 1598 for the funeral or memorial rites celebrated on the death of Philip II. In the 1602 print, this work is headed ‘Ad Exsequias Philip II Cathol. Regis Hisp’. It should be recognized as one of the masterworks of the late Renaissance. It has a calm power, tremendous pathos and awesome dignity. In typical Lobo fashion the treble parts follow each other down in imitation whilst the divided tenors follow each other up; mirror-fashion, the parts weave and cross in fine counterpoint, but always to express the mood and meaning of the text. Despite the overall feeling of religious devotion and sheer richness of sound, the typically Spanish use of canonic imitation was frequently exploited to great effect by Alonso Lobo. In his Ave Maria for 8 voices the strict canon is 8 ex 4 in which the two choirs and the canonic intervals (in time and pitch) are handled so skilfully that there is no monotony of choral antiphony, but an ever changing vocal scoring of great beauty. O quam suavis est, Domine is a glowing and warm expression of the words honouring the sweet sacrament of Communion. The six voices weave a rich harmonic texture but they each retain considerable individuality. Notice especially at the end how Lobo makes voice after voice climb gently through the others. The Ave Maria has similar moments, finely judged. From the first of these publications (Salamanca, 1607), the final Magnificat octavi toni is now part of the Westminster Cathedral Choir repertory. In this recording the Solemn Tone plainsong is used and the eight-part polyphony is accompanied by organ, bass dulcian and harp. The latter instrument has recently been made in the manner of the late Renaissance double-strung harp that would have been familiar to Monteverdi. From around 1580 Spanish cathedrals increasingly used the harp in addition to organ and dulcian as the standard choir continuo, especially in the festal works written for multi-voiced choirs. Vivanco’s lively and sumptuous setting is clear in its major tonality and contrasts with the plangent beauty of the motets by his contemporary Lobo. Both these men have worthy places beside Victoria, all of them the inheritors of Morales and Guerrero. Francisco Guerrero (1528–1599), né et mort à Séville, fut le compositeur le plus influent et le plus respecté de l’Espagne de Philippe II. Après avoir été nommé maestro de Jaén (à seulement dix-sept ans), il revint à Séville, d’abord comme chanteur puis, pendant longtemps, comme assistant de Pedro Fernández (qui vécut vieux mais était malade) et enfin, de 1574 à 1599, comme maestro de capilla de la cathédrale sévillane, la plus grande et la plus riche d’Espagne. Car si Tolède détenait le pouvoir, Séville, elle, dominait par la richesse et la splendeur de ses offices, de son chœur et de ses instrumentistes. Guerrero fit paraître des motets, des messes, des psaumes et des cantiques pour les vêpres, une musique pour l’office des morts, deux Passions et un beau recueil de villancicos religieux en espagnol. Ses publications éditées à Séville, Louvain, Paris, Rome et Venise couvrent les années 1555 à 1597. Bon musicien à la jolie voix de contralto (ténor aigu), il jouait de l’orgue, de la vihuela, de la harpe et du cornet à bouquin. Il eut brièvement pour professeur Morales—lui-même ancien élève de Peñalosa, un émule de Josquin—, croisa certainement le jeune Vivanco (qui devint presque son assistant) et connaissait bien Alonso Lobo (qui, lui, le devint vraiment). En 1581, à Rome, Guerrero rencontra Victoria, son cadet, qui lui rendit hommage en incluant deux de ses motets dans son propre recueil de 1585. Mais les connexions ne s’arrêtent pas là: à l’école d’Avila, Victoria et Vivanco ont pu n’avoir été séparés que d’une classe ou deux. Alonso Lobo, Andalou comme Guerrero, était maestro de Tolède quand Victoria s’installa à Madrid. Et ce fut Victoria qui lui servit d’agent pour l’impression de son Livre de messes (1602). Encore cette chaîne de musiciens ne relie-t-elle que quelques-uns des compositeurs qui, par centaines mais tout juste connus de nous, forgèrent une tradition musicale de haut vol non seulement au Siglo de Oro mais jusqu’à la fin du XVIIe siècle. Alors, et alors seulement, la musique espagnole déclina jusqu’à devenir une province du style italien. Les motets de Guerrero choisis pour cet enregistrement sont très variés, dans leur manière comme dans leur distribution vocale. Surge propera (1570), enjoué et bourré d’invention, éclaire vraiment l’interprétation ecclésiastique du Cantique des cantiques. La seconde voix soprane est un cantus firmus obstinatus, une phrase répétée cinq fois qui, dans la première moitié de l’œuvre, descend un degré de la gamme à chacune de ses apparitions avant de remonter par degré, cinq fois encore, dans la seconde moitié. Cet ostinato ayant pour texte «Veni sponsa Christi» («Viens, fiancée du Christ»), on voit bien que Guerrero ne percevait pas le Cantique des cantiques comme un simple poème d’amour en hébreu. Les cinq autres voix grouillent d’un contrepoint énergique, à travers lequel cette seconde voix soprane semble tailler, telle une poutre apparente—une technique dont Morales, éminent précurseur de Guerrero, était un fervent apôtre. Très harmonique, déclamatoire et clairement antiphoné, le motet à double chœur O altitudo divitiarum (1597) sonne, lui, beaucoup plus moderne. Il recourt à deux chœurs, un aigu (SSAT) et un grave (SATB), une scission qui, pendant un siècle, devint presque la norme en Espagne. Les instruments utilisés ici sont l’orgue, la harpe et la douçaine basse, conformément à la pratique sévillane du XVIe siècle finissant. Nouveau contraste avec une œuvre destinée au dimanche des Rameaux, le plaintif O Domine Jesu Christe (1570), dont la tristesse simple mais sincère anticipe toutes les souffrances de la Passion du Christ. Le chœur à quatre parties, non divisé, permet à Guerrero d’exploiter en toute liberté son don pour la mélodie expansive. O sacrum convivium (1570) s’adresse à un chœur à six parties porté sur les graves (SAATBB). Cette riche tapisserie sonore dépeint le banquet sacré de la Communion et toute la dévotion catholique pour ce sacrement—nous sommes au lendemain de la Réforme—est comme enchâssée dans cette inspiration extasiée, soutenue. Souvent, Guerrero vit ses œuvres publiées plusieurs fois de son vivant. Des siècles durant, elles furent copiées dans les livres de chœur des cathédrales, après que les éditions originales, usées, furent tombées en morceaux, faisant de Guerrero le compositeur le plus connu d’Espagne et de l’empire espagnol (Mexique, Lima, Bogotá). Ave virgo sanctissima, surtout, fut son plus grand «hit». Guerrero le publia en 1566, en 1570 et, de nouveau, en 1597. Des messes en furent dérivées, dont celles de Géry de Ghersem (1598; une étonnante pièce à sept voix, truffée de canons), Pedro Ruimonte (1604), Juan Esquivel (1608) et Juan del Vado (vers 1670; manuscrits à Madrid et à Avila). Son splendide texte honore la Vierge Marie, qu’il compare à la perle, au lis et à la rose, façon Cantique des cantiques biblique. Il y a cinq voix, les deux voix sopranes formant un canon à l’unisson. Des phrases douces et subtiles se réverbèrent à travers ces parties dans quelques-unes des plus évocatrices mélodies jamais écrites. Un épisode étonnant survient avant la moitié de l’œuvre, quand le mot «Salve» est mis en musique sur des entrées successives des quatre notes de l’intonation grégorienne du «Salve regina», mais avec un demi-ton haussé qui mue le climax en un véritable drame. Puis cette œuvre, la plus célèbre de Guerrero, s’éloigne doucement, de plus en plus calme, jusqu’à une conclusion paisible. La dernière contribution de Guerrero à ce recueil est l’éclatant et triomphant Regina caeli laetare (1584); curieusement non antiphoné, il ne s’en adresse pas moins à huit voix distribuées en deux chœurs égaux. Les retentissants «Alleluia» qui terminent chaque section révèlent toute la vigueur dont Guerrero pouvait se montrer capable. Voilà qui contrarie l’image, véhiculée par les histoires de la musique, d’un Guerrero trop doux, n’ayant la force ni d’un Morales, ni d’un Victoria. Alonso Lobo naquit en 1555 à Osuna, une ville située à environ soixante-dix kilomètres de Séville. Après s’être élevé à la dignité canoniale en la collégiale de sa cité, il s’installa à Séville où il fut nommé, en 1591, assistant—et probable successeur—du vieux Francisco Guerrero. Sa réputation devait être considérable car le chapitre sévillan lui offrit le poste sans le soumettre aux habituels tests d’aptitude musicale. Il demeura à Séville de septembre 1591 à septembre 1593, date à laquelle il fut élu pour remplacer Ginés de Boluda au poste de mastro de capilla à la cathédrale de Tolède. Plus tard, en 1604, il retrouva la cathédrale de Séville, dont il resta le maître de chapelle jusqu’à sa mort, en avril 1617. Lobo nous légua, parmi ses œuvres les plus importantes, six messes (dont une parodie sur un motet palestrinien de la Pentecôte, O rex gloriae) et sept motets dévotionnels, dont il supervisa la publication à Madrid en 1602. Présente dans de grands centres comme la chapelle Sixtine, Rome et Coïmbre, au Portugal, cette publication atteignit également le Nouveau Monde—on en compte pas moins de cinq exemplaires au Mexique. Ces œuvres, et d’autres encore, furent utilisées en Espagne, au Portugal et au Mexique pendant plus de deux siècles après la mort de Lobo: en 1772, ses Lamentations furent encore recopiées dans un livre de chœur sévillan; et, selon les règles du chapitre de la cathédrale de Séville en 1648, son Credo Romano était obligatoire certains jours, notamment les dimanches et à la Fête-Dieu. Les sept motets de l’ouvrage de 1602 sont désormais disponibles dans des éditions modernes chez Mapa Mundi. D’une facture constamment élevée et singulière, ils mettent l’accent sur l’expression et la qualité sonore, dans une atmosphère de dévotion religieuse intense, sans être tragique. L’écriture des voix est parfois hachée, mais toujours à des fins expressives. La régularité et la perfection de la ligne romaine, telle qu’on la rencontre chez Palestrina et même chez Victoria, n’a rien d’emblématique. Le style est frappé au coin du pays: tout comme Byrd, Weelkes et Gibbons avaient un style typiquement anglais, les motets de Lobo et de ses contemporains, Esquivel et Vivanco, commencent à être reconnus comme particulièrement espagnols. Versa est in luctum a dû être écrit en 1598 pour le service funèbre de Philippe II ou pour la commémoration de sa mort. Dans l’édition de 1602, cette pièce porte en épigraphe «Ad Exsequias Philip II Cathol. Regis Hisp». Il faudrait la reconnaître comme l’un des chefs-d’œuvre de la Renaissance tardive. Il s’en dégage une force tranquille, un immense pathos et une impressionnante dignité. Comme toujours chez Lobo, les voix sopranes se suivent en imitation descendante tandis que les ténors divisés le font en imitation ascendante; comme un miroir, les parties se faufilent et se croisent en un beau contrepoint, mais toujours pour charrier l’atmosphère et le sens du texte. Le sentiment de dévotion religieuse et l’impressionnante richesse sonore n’empéchèrent pas Alonso Lobo de recourir souvent, avec beaucoup d’effet, à la très espagnole imitation canonique. Dans son Ave Maria à huit voix, le canon strict est 8 ex 4: les deux chœurs et les intervalles canoniques (mesure et hauteur de son) y sont si habilement traités qu’il n’y a aucune antiphonie chorale monotone, mais une splendide distribution vocale sans cesse changeante. O quam suavis est, Domine traduit avec éclat et chaleur les mots honorant le doux sacrement de la Communion. Les six voix tissent une riche texture harmonique tout en conservant chacune une immense singularité. Remarquez surtout comment, à la fin, Lobo fait se hisser les voix les unes après les autres. L’Ave Maria aussi connaît de ces moments finement jaugés. Le dernier Magnificat octavi toni, tiré du recueil de 1607 (Salamanque), fait désormais partie du répertoire du chœur de la cathédrale de Westminster. Sur cet enregistrement, le plain-chant employé est celui du ton solennel et la polyphonie à huit parties est accompagnée par l’orgue, la douçaine basse et la harpe. Celle utilisée ici a récemment été fabriquée à la manière d’une harpe double de la Renaissance tardive, telle que la connaissait Monteverdi. À partir d’environ 1580, les cathédrales espagnoles l’associèrent à l’orgue et à la douçaine comme continuo standard des chœurs, surtout dans les œuvres de fête écrites pour les chœurs à voix multiples. La version enjouée et somptueuse de Vivanco, limpide en sa tonalité majeure, contraste avec la beauté plaintive des motets de Lobo. Ces deux hommes se posent en dignes contemporains de Victoria, héritier comme eux de Morales et de Guerrero. Zur Zeit Philipps II. war Francisco Guerrero der einflussreichste und anerkannteste Komponist Spaniens. Er war 1528 in Sevilla geboren worden und starb dort im Jahre 1599. Im Alter von 17 Jahren wurde er bereits in Jaén zum Kapellmeister ernannt, kehrte dann jedoch nach Sevilla zurück, wo er zunächst als Sänger und dann viele Jahre lang als Assistent von Pedro Fernández tätig war, der zwar kränklich war, aber sehr alt wurde. Schließlich wirkte er von 1574 bis 1599 als maestro di capilla an der größten und opulentesten Kathedrale Spaniens. Wenn auch in Toledo die Macht saß, so übertraf Sevilla alle anderen Kathedralen mit ihren Reichtümern und der Pracht ihrer Gottesdienste, ihres Chors und ihrer Instrumentalisten. Guerrero veröffentlichte Motetten, Mess- und Psalmvertonungen, Lobgesänge für die Vesper, Musik für die Totenmesse, zwei Passionen und eine eindrucksvolle Sammlung von religiösen spanischen villancicos (die nicht auf Latein, sondern in der Umgangssprache verfasst waren), die in verschiedenen Drucken in Sevilla, Löwen, Paris, Rom und Venedig herauskamen. Seine Publikationen erschienen von 1555 bis 1597. Guerrero war ein versierter Musiker, der über eine wunderschöne tiefe Altstimme (bzw. hohe Tenorstimme) verfügte sowie Orgel, Vihuela, Harfe und Zink spielte. Für kurze Zeit erhielt er Unterricht von Morales, der seinerseits ein Schüler von Peñalosa gewesen war, welcher sich wiederum stilistisch an Josquin orientierte. Guerrero lernte den jungen Vivanco kennen, der fast sein Assistent wurde, und er kannte zudem Alonso Lobo, der diese Stelle besetzte. 1581 begegnete er Victoria, als sich beide Komponisten in Rom aufhielten, und Victoria zollte dem älteren Kollegen Tribut, indem er zwei von Guerreros Motetten in seinen eigenen Band von 1585 mit aufnahm. Die Verbindungen gehen weiter: Victoria und Vivanco können nur eine oder zwei Klassen auseinander gewesen sein, als sie in Avila zur Schule gingen. Alonso Lobo stammte wie Guerrero aus Andalusien und war Kapellmeister in Toledo, als Victoria sich in Madrid niederließ. Und Victoria war derjenige, der sich dafür einsetzte, dass Lobos Messbuch von 1602 gedruckt wurde. Diese Gruppe von Komponisten waren nur einige der vielen hundert, die bisher heute kaum bekannt sind, aber eine Tradition repräsentieren, die nicht nur erstklassige Musik hervorbrachte, sondern sich auch bis zum Ende des 17. Jahrhunderts erstreckte. Danach, und erst dann, fiel die spanische Musik quasi als eine Art Ausläufer des italienischen Stils zurück. Die für diese Einspielung ausgewählten Motetten Guerreros sind sowohl stilistisch als auch in der Stimmverteilung abwechslungsreich. Surge propera (1570) ist lebhaft und phantasievoll vertont und macht die kirchliche Interpretation des Hohelieds sehr deutlich. Die zweite Sopranstimme ist ein cantus firmus obstinatus, der fünf Mal wiederholt wird und in der ersten Hälfte des Werks bei jeder Wiederholung um eine Stufe nach unten steigt. Dann steigt diese Phrase in der zweiten Hälfte wiederum stufenweise und wiederum fünfmal nach oben. Der Text dieses Ostinato heißt „Veni sponsa Christi“—„Komm, Braut Christi“—und zweifellos war für Guerrero das Hohelied mehr als lediglich hebräische Liebeslyrik. In den anderen fünf Stimmen wimmelt es geradezu von energischen Kontrapunkten, während dieser zweite Sopran unabhängig davon wie eine tragende Säule darin steht. Guerreros großer Vorgänger Morales war ein begeisterter Vertreter dieser Technik. Ganz anders, und insgesamt deutlich moderner gestaltet, ist die durch und durch harmonisch, deklamatorisch und antiphonisch gehaltene Doppelchor-Motette O altitudo divitiarum (1597). Hier erklingen ein hoher (SSAT) und ein tiefer Chor (SATB)—eine Stimmaufteilung, die in Spanien fast ein Jahrhundert lang standardmäßig zum Einsatz kam. Hier werden in diesem Werk Orgel, Harfe und Bassdulzian eingesetzt, was der Aufführungspraxis in Sevilla gegen Ende des 16. Jahrhunderts entspricht. Für einen weiteren Kontrast sorgt das klagende O Domine Jesu Christe (1570) für Palmsonntag, ein Werk schlichter, aber doch tiefempfundener Trauer, in dem jegliche Leiden der Passion Christi antizipiert werden. Der ungeteilte vierstimmige Chor gibt Guerrero Gelegenheit dazu, seine ausgedehnten Melodien wirkungsvoll zum Einsatz zu bringen. O sacrum convivium (1570) ist für sechsstimmigen Chor angelegt, wobei die tiefen Stimmen im Vordergrund stehen (SAATBB). Es handelt sich dabei um einen prächtigen Klangteppich, der das heilige Abendmahl darstellt. In diesem verzückten und anhaltenden Werk scheint die nachreformatorische katholische Hingabe zu diesem Sakrament in ihrer Gänze dargestellt zu werden. Viele Werke Guerreros wurden zu seinen Lebzeiten mehr als einmal veröffentlicht. Zahlreiche Stücke wurden noch jahrhundertelang in die Chorbücher der Kathedralen eingetragen, nachdem die Originaldrucke vom häufigen Gebrauch auseinandergefallen waren. Als Komponist war er in Spanien und im spanischen Reich—so etwa in Mexiko, Lima und Bogotá—bekannter als alle anderen. Dabei war das Ave virgo sanctissima sein größter „Hit“. Guerrero veröffentlichte das Werk erstmals im Jahre 1566, erneut im Jahre 1570 und nochmals 1597. Diese Motette wurde von anderen Komponisten als Grundlage für Messvertonungen verwendet und entsprechend herausgegeben, so etwa von Géry de Ghersem (1598; ein erstaunliches siebenstimmiges Werk voller Kanons), Pedro Ruimonte (1604), Juan Esquivel (1608) und Juan del Vado (ca. 1670; Manuskripte in Madrid und Avila). Ave virgo sanctissima hat einen besonders schönen Text, in dem die Heilige Jungfrau geehrt und, ähnlich wie im alttestamentarischen Hohelied, mit einer Perle, einer Lilie und einer Rose verglichen wird. Das Werk ist fünfstimmig gesetzt, wobei die beiden Sopranstimmen einen Einklangskanon bilden. In diesen Stimmen erklingen liebliche Phrasen, die sich durch besonders plastische Melodien auszeichnen. Eine hinreißende Episode vollzieht sich kurz vor der Mitte des Stücks, wo das „Salve“ auf aufeinanderfolgende Einsätze der Vierton-Intonation des „Salve regina“-Cantus planus vertont ist, jedoch um einen Halbton erhöht, wodurch sich der Höhepunkt ganz dramatisch gestaltet. Dieses äußerst berühmte Werk Guerreros klingt allmählich aus und kommt zu einem friedlichen Ende. Das letzte Werk Guerreros auf der vorliegenden Einspielung ist sein strahlendes und triumphierendes Regina caeli laetare (1584), welches zwar nicht besonders antiphonisch gehalten, aber doch für acht Stimmen gesetzt ist, die gleichmäßig auf zwei Chöre verteilt sind. Die klangvollen „Alleluia“-Schlüsse der Abschnitte jeweils zeigen, wie lebhaft Guerreros Musik sein konnte. Damit wird klar, dass der von musikhistorischen Werken vermittelte Eindruck, dass Guerreros Werke übermäßig süß gewesen und nicht die Kraft eines Morales oder eines Victoria besessen hätten, nicht zutreffend ist. Alonso Lobo wurde 1555 in Osuna geboren, eine Stadt, die etwa 75 Kilometer von Sevilla entfernt liegt. Nachdem er es an der Kollegiatskirche zu Osuna zu einem Kanonikat gebracht hatte, wurde er 1591 zum Berater des inzwischen alternden Francisco Guerrero in Sevilla ernannt (und damit sicherlich auch zu dessen Nachfolger auserkoren). Sein Ruf zu dieser Zeit muss beträchtlich gewesen sein, da ihm das Domkapitel in Sevilla diese Stelle ohne die üblichen musikalischen Eignungsprüfungen übertrug. Er blieb vom September 1591 bis zum September 1593 in Sevilla und wurde dann zum maestro di capilla an der Kathedrale zu Toledo ernannt, womit er die Nachfolge von Ginés de Boluda antrat. Ein paar Jahre später, 1604, kehrte Lobo nach Sevilla zurück, wo er Kapellmeister an der Kathedrale wurde; dort blieb er bis zu seinem Tod im April 1617. Seine bedeutendsten überlieferten Werke sind sechs Messen (eine davon ist eine Parodiemesse über Palestrinas Pfingstmotette O rex gloriae) und sieben religiöse Motetten, die 1602 in Madrid unter der Beaufsichtigung des Komponisten veröffentlicht wurden. Diese Ausgabe fand sich nicht nur in so bedeutenden Musikzentren wie der Sixtinischen Kapelle in Rom und im portugiesischen Coimbra, sondern sie gelangten auch in die Neue Welt—in Mexiko sind heute nicht weniger als fünf Exemplare erhalten. Diese und auch andere Werke Lobos waren in Spanien, Portugal und Mexiko noch über zwei Jahrhunderte nach seinem Tod im Gebrauch—seine Klagegesänge wurden 1772 neu in ein Chorbuch in Sevilla eingetragen und sein Credo Romano war in Sevilla gemäß der Regeln des Domkapitels von 1648 ein obligatorischer Bestandteil der Sonntagsgottesdienste sowie von Fronleichnam und einigen anderen Festtagen. Alle Motetten der Ausgabe von 1602 sind heute in modernen praktischen Ausgaben von Mapa Mundi erhältlich. Das Niveau dieser sieben individuellen Motetten ist durchgängig hoch. Betont werden hier der Ausdruck und die Klangschönheit in einer Atmosphäre intensiver, aber nicht dramatischer religiöser Hingabe. Die Stimmlinien weisen zum Teil einen gewissen kantigen Verlauf auf, jedoch stets zu expressiven Zwecken. Die römische Ebenheit und Vollkommenheit der musikalischen Linien, die sich bei Palestrina und sogar Victoria findet, sind hier nicht charakteristisch. Der Stil ist als provinziell im wahrsten Sinne des Wortes zu bezeichnen—in gleicher Weise wie der Kompositionsstil von Byrd, Weelkes und Gibbons typisch englisch war, so werden die Motetten von Lobo und seinen Zeitgenossen Esquivel und Vivanco zunehmend als typisch spanisch wahrgenommen. Versa est in luctum muss 1598 zur Trauer- beziehungsweise Gedenkfeier Philipps II. entstanden sein—in der Druckausgabe von 1602 trägt es die Überschrift: „Ad Exsequias Philip II Cathol. Regis Hisp“. Dieses Stück sollte als ein Meisterwerk der Spätrenaissance anerkannt werden. Es besitzt eine ruhige Kraft, unglaubliches Pathos und eindrucksvolle Würde. Wie so oft bei Lobo ist der Verlauf der beiden Sopranstimmen, die imitativ gesetzt sind, nach unten gerichtet, während die geteilten Tenorstimmen sich aufwärts bewegen; die Stimmen weben und durchkreuzen gleichzeitig einen feingliedrigen Kontrapunkt, jedoch immer im Dienste der Textausdeutung. Trotz einer vorherrschenden Atmosphäre der religiösen Hingabe und des Klangreichtums wurde die typisch spanische Technik der kanonischen Imitation von Alonso Lobo oft besonders wirkungsvoll eingesetzt. Sein achtstimmiges Ave Maria hat einen strengen 8-ex-4-Kanon, wobei die beiden Chöre und Einsatzintervalle so geschickt gehandhabt sind, sowohl was das Zeitmaß als auch was die Tonhöhe anbetrifft, dass sich in dem antiphonischen Chorsatz keine Monotonie einstellt, sondern eine sich stets verändernde Stimmbesetzung von besonderer Schönheit erklingt. O quam suavis est, Domine ist ein leuchtender und warmer Ausdruck der Worte, die das süße Sakrament des Abendmahls ehren. Die sechs Stimmen verbinden sich zu einem reichhaltigen harmonischen Klanggewebe, wobei sie jedoch ebenfalls ein beachtliches Maß an Individualität beibehalten. Besonders bemerkenswert ist das Ende, wo Lobo jede Stimme behutsam durch die anderen hindurch führt. Im Ave Maria erklingen ähnliche, sorgfältig konstruierte Passagen. Aus der ersten dieser Veröffentlichungen (Salamanca 1607) ist das letzte Magnificat octavi toni heute Teil des Repertoires des Westminster Cathedral Choir. Bei der vorliegenden Einspielung wurde der Tonus solemnis verwendet und die achtstimmige Polyphonie wird von Orgel, Bassdulzian und Harfe begleitet. Diese Harfe ist kürzlich im Stil der zweireihigen Harfe der Spätrenaissance gebaut worden, die auch Monteverdi vertraut war. Ab 1580 kamen Harfen an den spanischen Kathedralen zunehmend zusammen mit der Orgel und dem Dulzian als Standard-Continuobegleitung für die Chöre zum Einsatz, insbesondere in den mehrstimmigen Werken, die für Festtage entstanden. Vivancos lebhafte und prächtige Vertonung tritt klar in Dur auf und bildet einen deutlichen Kontrast zu der klagenden Schönheit der Motetten seines Zeitgenossen Lobo. Beide Komponisten nehmen zurecht ihre Plätze neben Victoria ein; sie sind allesamt Erben von Morales und Guerrero.